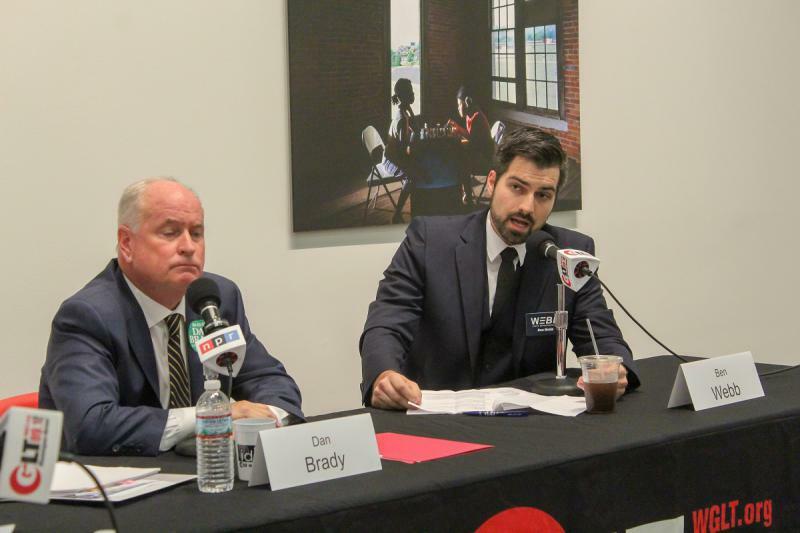 State Rep. Dan Brady, left, and Democratic challenger Ben Webb at the GLT debate Wednesday, Oct. 10, 2018, at University Galleries in Uptown Normal. 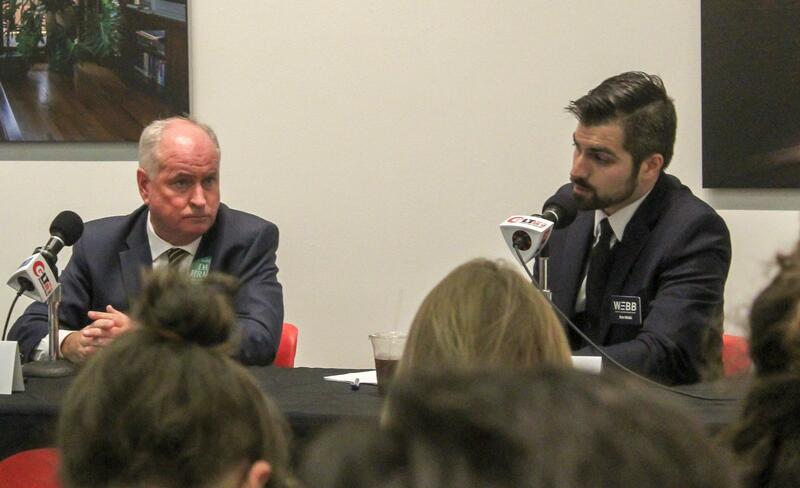 State Rep. Dan Brady, R-Bloomington, and Democratic challenger Benjamin Webb talk higher ed during a GLT candidate forum. 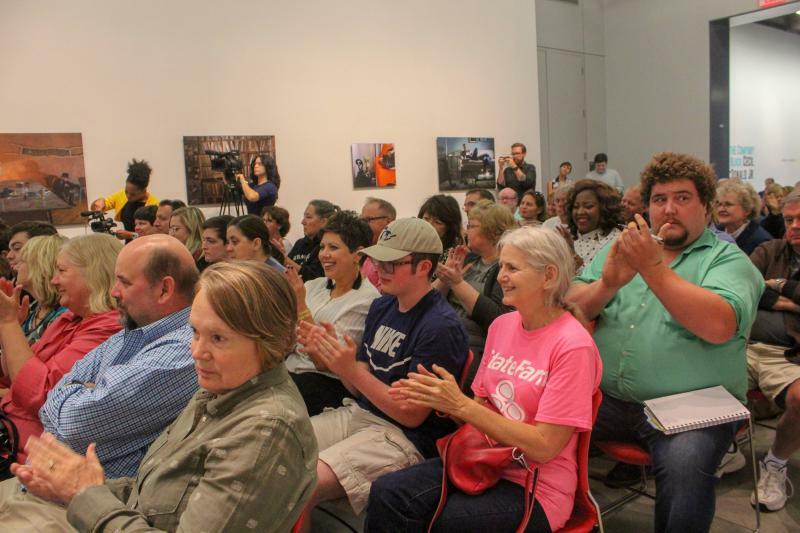 The packed University Galleries at the 105th House District debate on Wednesday, Oct. 10, 2018, in Uptown Normal. Seeking his 10th term, Republican incumbent state Rep. Dan Brady and Democratic challenger Ben Webb each have their own ties to the issue. Webb is an English and drama teacher at University High School in Normal. 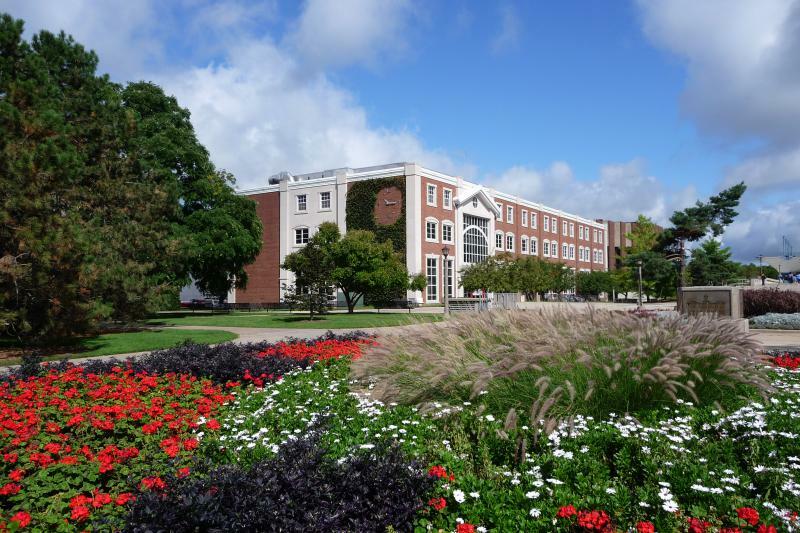 He said while he was pleased to see more money for Illinois State University in this year’s budget, Brady and others in the legislature have put the state’s public universities in jeopardy. “I was very happy to see a 2 percent increase, but I can’t celebrate a 2 percent increase after a 10 percent cut, after the 2016 year where we had 71 percent of our funding cut,” he said. 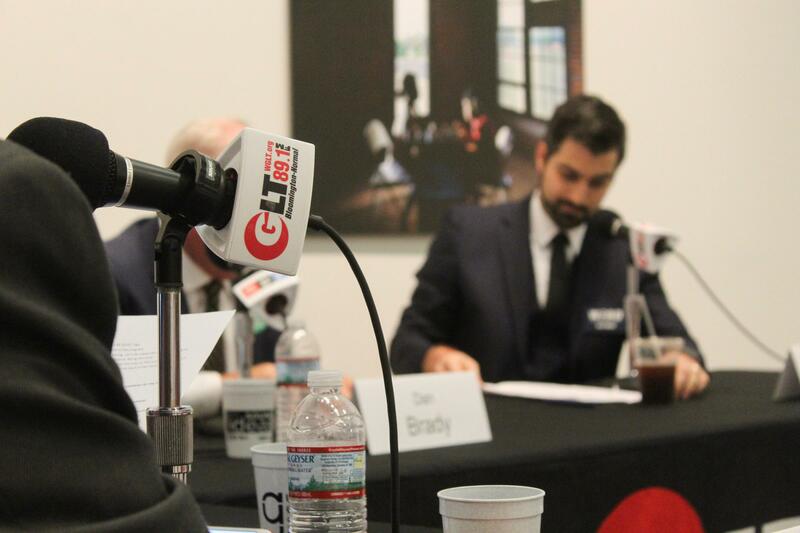 Brady objected to Webb’s claims that he was anything but a proponent of Illinois universities. 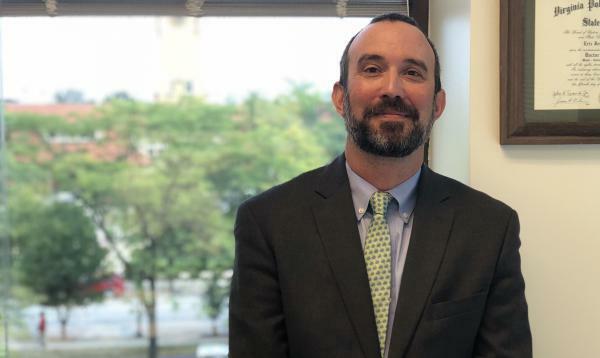 Brady pointed to his work on the Higher Education Appropriations Committee to develop a stopgap budget with funding for public universities during the state’s budget impasse. 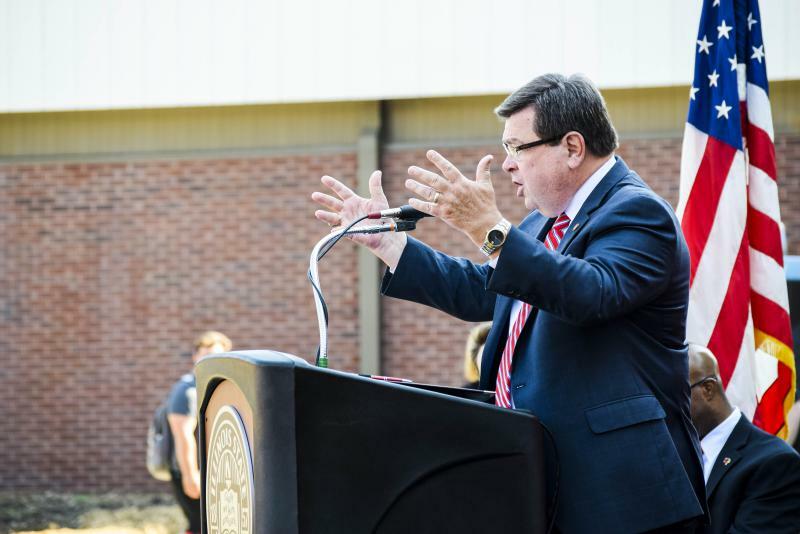 “I worked very diligently to make sure that Illinois State University had a fair amount of appropriation in that stopgap budget, because the formula I saw wasn’t fair and was slighted to those individuals that were having more difficulty,” he said. Brady also touted membership in the bipartisan Higher Education Working Group that helped write several bills passed this summer, including additional Monetary Award Program (MAP) funds and a new $25 million merit-based scholarship program. The candidates also mused on the possibility of a new higher education funding formula in Illinois. The state passed a K-12 funding overhaul last year. Webb said he believes state universities would welcome a similar change. “They want to see that stability, and they want to know that it’s not just based on the previous (funding) history," Webb said. A new higher ed funding formula would need to be performance based, Brady said, tying funding to outcomes like retention and graduation. It’s a matter Brady’s working group is already talking about, he added. But where would more money for top priorities like higher education come from? For Brady, Illinois needs to get back to basics. “The priorities of the state should be public education, public infrastructure and public safety,” he said. Brady said over the last 15 years Illinois has diverted tax dollars away from its core functions, especially education, spending beyond its means. “It has to stop," he said. As for the idea of a progressive income tax, Brady said state government has yet to prove it can be trusted with additional taxpayer dollars. “I think people should stop and ask themselves, ‘What am I going to pay more money for through a tax, and where am I going to get the guarantee that those priorities I mentioned earlier are going to be followed?’ Because they haven’t been,” he said. GLT has scheduled more candidate forums for Illinois’ 88th House District on Oct. 17 and the 13th Congressional District on Oct. 29. See the full schedule at WGLT.org/Forums.